We all want to lead a life of our own making. But in today's accelerated world, with its competing priorities, information overload, and confounding options, we can easily find ourselves steered by impulse, stress, or expedience. Are our decisions the right ones? Or are we being governed, time and time again, and against our best intentions, by the demands of the moment? A transformative new approach to decision making, 10-10-10 is a tool for reclaiming your life at home, in love, and at work. The process is clear, straightforward, and transparent. In fact, when you're facing a dilemma, all it takes to begin are three questions: What are the consequences of my decision in 10 minutes? In 10 months? And in 10 years? Sound simple? Not quite. Recounting poignant stories from her own life and the lives of many other dedicated 10-10-10 users, Suzy Welch reveals how exploring the impact of our decisions in multiple time frames invariably surfaces our unconscious agendas, fears, needs, and desires -- and ultimately helps us identify and live according to our deepest goals and values. 10-10-10's applicability is uniquely broad. Whether it is used by college students or busy mothers or senior business executives, artists, government administrators, or entrepreneurs, 10-10-10 has shown its effectiveness in decisions large and small, routine and radical, consistently changing lives for the better. Readers of O magazine discovered this pragmatic and innovative idea when Suzy Welch first introduced it in her column. Now, in this immensely useful and revelatory book, she fully explains the power of 10-10-10, a transformative idea that can replace chaos with consistency, guilt with joy, and confusion with clarity. This reading group guide for 10-10-10 includes an introduction, discussion questions, and ideas for enhancing your book club. The suggested questions are intended to help your reading group find new and interesting angles and topics for your discussion. We hope that these ideas will enrich your conversation and increase your enjoyment of the book. 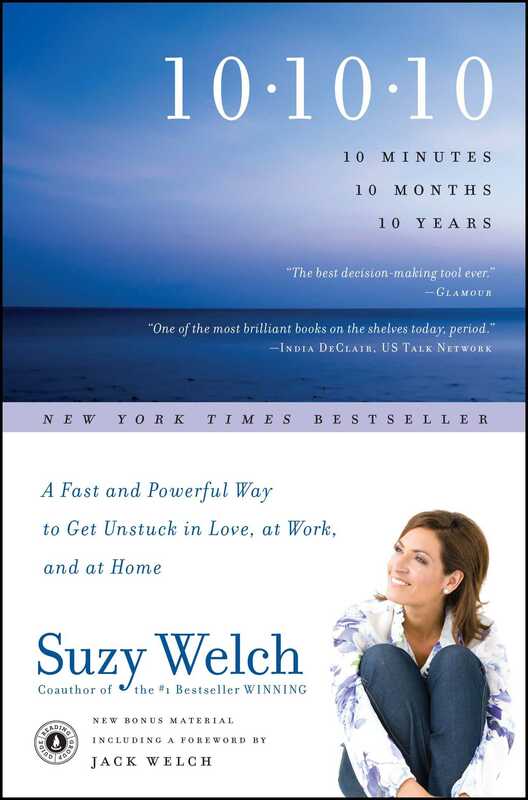 In this New York Times bestseller, author, commentator, and business journalist Suzy Welch shares the process of 10-10-10, her innovative approach to thinking about—and resolving—the life dilemmas that all too often leave us feeling paralyzed. An antidote to the mounting pressure to make too many choices in too little time, this powerful new idea can be applied to issues encountered at work, in marriage and other personal relationships, as a parent, and a friend. By considering each of your options and projecting their outcomes in 10 minutes, 10 months, and 10 years, you’ll learn how to “get unstuck” and make the kind of deliberate, proactive decisions that lead to the life you truly want for yourself and a future without guilt and regret. The discipline, as illustrated through the personal stories of 10-10-10 users around the world, can ultimately be drawn upon to help you to untangle your priorities, excavate your own deeply-held values, and reclaim your life, one decision at a time. 1. Suzy describes how she came up with 10-10-10 after making a particularly poor decision -- to bring her children along on a business trip to Hawaii in an attempt to “crack the work-life balance code” and make everyone happy. As her plans unravel, she has the scary realization that her life is “living her,” rather than the other way around. Have you ever tried to “do it all” or juggle several major aspects of your life in order to please everyone at once? How did that experience turn out? Were there, in retrospect, alternative choices you could have made at the time that would have caused you to end up in a different place? 2. In her explanation of the evolutionary biology of decision-making, Suzy discusses “hyperbolic discounting,” or the idea that people tend to “act as if the future doesn’t exist or will be ideal.” Can you cite instances where you exhibited this behavior? Out of the immediate, mid-term, and distant future, which timeframe do you typically give the most weight to when making a decision? 3. Suzy talks about the “wisdom” of gut instinct as an imperfect science at best. How often do you rely purely on gut? In what instances have your instincts turned out to be correct? Incorrect? Have your gut decisions left you feeling in control of your life? 4. 10-10-10 becomes much more powerful when you work to candidly identify what it is that you value, and how much. Having read this book, can you name some of your own values and prioritize them? Make a list of values you hold relating to a single area of life: love, friendship, faith, work or parenting -- then do your best to rank order them. Were you aware of these values before? Do you think they have shifted or changed over time? If so, how? Are there any values that you have found difficult to admit to others, or even to yourself? 5. Suzy outlines our all-too-common propensity towards “escalating commitment” or the tendency to stay attached to a project or relationship that is clearly failing. Indeed, most of us have been guilty of staying in an unhealthy relationship too long, or simply out of inertia at one point or another. In light of this, how might you use 10-10-10 to evaluate your relationships, either working alone or in conversation with your partner? How can you both go about bringing your values into the equation? 6. In discussing the application of 10-10-10 in careers, Suzy explains that “no job or profession will ever be right for you if it requires you to work with people who don’t share your values or appreciate you as you are. You have to like your colleagues—and feel authentic around them—if you are ever going to have a career you like.” See if you can come up with an example of a time when the values of your co-workers were in line with your own, as well as a time when they weren’t. How did the overall job experiences differ? 7. Have you ever experienced a career stall? How did you get through it? If you had used 10-10-10, would the outcome have been different? How so? 8. Was there a particular story in the book that echoed a personal experience of your own or that you found you could especially relate to? Explain why. 9. Can you think of a time when you have deliberately ended a friendship or had a friend end one with you? Discuss ways 10-10-10 might help you reconnect with that person (or decide that is not the best route after all). 10. Identify a parenting dilemma that you or someone you know has faced. Did guilt play a role in the decision process? How was the problem finally resolved? Were the children able to participate in the process? In what ways could 10-10-10 have been used to affect the outcome? 11. Do you often struggle with moments when work and the rest of life -- be it family time, love, leisure or even faith -- collide? How might you use 10-10-10 to better communicate with everyone involved? 12. Before you heard about the 10-10-10 process, how did you typically approach difficult decisions? 13. Is there a choice you have made in the past that you especially regret? Why? How might have 10-10-10 changed the experience? 14. In the final chapter, Suzy offers 10-10-10 as one solution to a general lack of happiness that she feels too many people experience today, perhaps as a result of rushed or compromised decision-making. Do you agree with her observation? Try to create your own “Happiness List” of people or couples you know who are truly happy. What percentage of your circle of friends makes the cut? What strategies do you think have helped this group maintain their happiness? What keeps people from being happy? 1. Please check out Suzy’s website at www.SuzyWelch101010.com and post a 10-10-10 story of your own. 2. You can also follow Suzy on Twitter: @SuzyWelch | www.twitter.com/SuzyWelch. 3. Together, Jack and Suzy Welch authored the #1 bestseller Winning, and they also currently write a weekly column for BusinessWeek on business and career challenges. Find out more about their work at www.WelchWay.com. Suzy Welch, former editor-in-chief of the Harvard Business Review, is a work-life columnist for O The Oprah Magazine. She is the coauthor, with her husband Jack Welch, of the New York Times bestseller Winning and of “The Welch Way,” published in BusinessWeek magazine and internationally by the New York Times Syndicate. She lives in Boston. Suzy Welch es una destacada periodista, autora y oradora. Es columnista en temas de trabajo y vida para la revista O, The Oprah Magazine y colaboradora de O’s Big Book of Happiness (El gran libro de la felicidad de O) y ejerce como Ejecutiva Residente en el Centro de Liderazgo de Mujeres de Babson College. Suzy, madre de cuatro adolescentes, es ex editora de Harvard Business Review, y co-autora, con su esposo, Jack Welch, del libro Winning, que ocupó el primer lugar entre los libros más vendidos. La columna de ambos, “The Welch Way,” (El sistema Welch) se publica nacionalmente en la revista BusinessWeek y se distribuye internacionalmente por la agencia periodística New York Times Syndicate.